Tuesday was the quarterfinals day at the 39th Edition of the African Junior Championships at the Tuks Tennis Academy in Pretoria, South Africa. Kenya had two representatives at this stage, Ryan Randiek in the boys' 14 & under and Sneha Kotecha in the same category on the girls' side. And it was a bitter sweet day for Kenya. Randiek was first up on court against a formidable opponent in the diminutive figure of Morocco’s Elyes Marouani. Randiek made a strong start leaping ahead 2-0 in the opening set before Marouani got off the blocks to level at 2-2. The two traded shots and the Moroccan stood on the brink of bagging the first set at 5-4 and then later at 6-5. Randiek however leveled matters to take the first set into a tie break which he duly won for himself and Kenya. The second set was also tightly contested but only in the initial phases as matters were all level at 2-2 before Randiek pulled away from the Moroccan to reel off four straight games to earn an impressive last four slot. Randiek’s opponent in the semis will be the Nigerian Michael Osewa who overcame the challenge of Jason Espitalier Noel in the other quarterfinal in the top half of the draw. 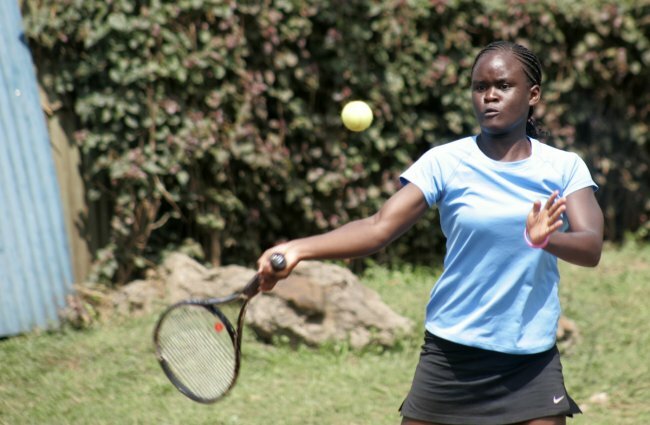 Following on from her team mates win as she did yesterday, Sneha Kotecha was hoping to make it a duo of Kenyan representatives into the last four on the biggest African stage in Junior Tennis. Kotecha faced Burundian Aisha Niyonkuru in her afternoon match and she encountered a blip early on losing the first set. Kotecha was however on song in the second set which saw her level matters to take the tie into a third set decider. She led all the way in the second set holding leads at 3-2 and later 5-4. At this point, Kotecha held three match points with Niyonkuru serving to try and save the match. Painfully though, Kotecha was unable to convert the match points and saw the Burundian charge back to level at 5-5 and then break in the very next game to lead 6-5 and stand on the brink of victory herself. The tie would however go the distance as Kotecha leveled to take the third set to a nail biting tie break. It wasn’t meant to be for Kotecha as her inability to convert any of her earlier match points came back to haunt her. A brave fight from Kotecha but nonetheless, the result was a win for the Burundian who just managed to edge the tie break 10-8 and win herself and her nation a slot in the last four. All Kenyan interests are in one basket, resting with Randiek who will be hoping to put Kenya one match away from victory as the action resumes tomorrow at the Tuks Academy grounds.